VietNamNet Bridge - A bicycle created by a university student uses two kinds of clean energy, the first of its kind in Vietnam. The increased number of vehicles using fossil fuels has put pressure on the environment and caused problems such as air pollution, traffic jams and traffic accidents. After eight months of research and development, Trung created a bicycle which runs well without petrol. With the product, Trung wants to heighten people’s awareness of the importance of renewable energy and environmental protection in large cities. “I want to see motorbikes rolling on streets with two kinds of clean energy one day,” he said. Solar energy is the most commonly used source of renewable energy. It allows a vehicle to run without maintenance and noise. The energy from electromagnetic induction acts as an electricity generator to charge the vehicle when running to offset the consumed energy. 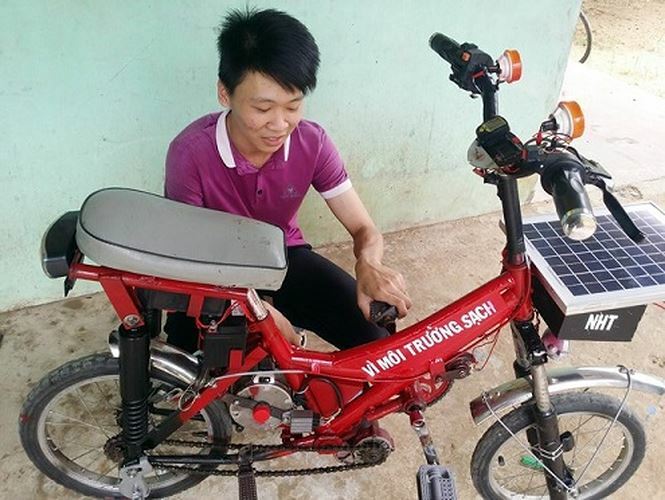 Trung’s bicycle is equipped with a 350 W electric motor powered by two batteries that can store electricity. After a full charge of electricity, the bicycle can travel a distance of 60km without sunshine. In the sun, the bicycle operates without the pedal recharging it as there is a storage device from the solar panel.